The ONEIL Center for Research Communication provides multidisciplinary, experiential learning opportunities to Wright State University students to create a talent pipeline of professionals trained in the art of communicating science and research, and to increase its clients’ productivity and ability to communicate their technical work to diverse audiences. With the help of the ONEIL Center for Research Communication, we’ll be able to expand our reach in the fields of healthcare, alternative energy, and cybersecurity by utilizing the ONEIL Center’s students and experts to develop first-in-class funding proposals, grant submissions, media communications, and much more. The ONEIL Center for Research Communication was founded in 2017 and made possible by a generous gift from O’Neil & Associates, a company located in Miamisburg, Ohio that provides world class product support services to the aerospace, defense, and commercial industries. 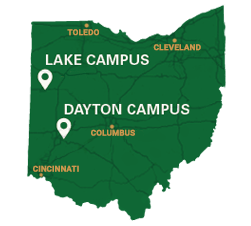 Located at Wright State University, The ONEIL Center for Research Communication provides a comprehensive suite of services to support the research enterprise via an innovative experiential learning approach to train students from multiple disciplines in the art of communicating science and research. The center’s student interns participate in the center’s business operations and receive practical experience working with the center’s clients to produce proposals, technical documents, graphics, videos, posters, and web tools. The ONEIL Center for Research Communication serves diverse industries and sectors, including commercial, defense, academic, medical, and government & non-profit organizations by helping them to communicate their technical work to diverse audiences. The center also benefits research faculty and their graduate students by providing editing services for theses, dissertations, conference papers, and journal articles. The center unburdens faculty by allowing them to focus on the scholarly merit of the technical content without having to spend their valuable time editing their graduate students’ manuscripts. Furthermore, they can be confident in the quality of their students’ work, given our university-based center’s commitment to editorial ethics and to preserving the academic integrity of our clients’ manuscripts. By referring my students to the ONEIL Center for Research Communication, I anticipate increasing my own research productivity through spending less time reviewing their work. Furthermore, I appreciate that the ONEIL Center’s affiliation with Wright State university means that I can be confident in the academic integrity of my students’ materials.